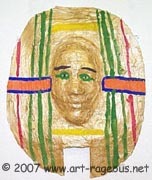 After a brief introduction to Egyptian art and culture through movies, books, and internet images, my 5th and 6th grade students' first project involved the making of Hieroglyphic cartouche pendants. Using their names and "Shrinky Dinks" material, they were able to create really beautiful pendants. 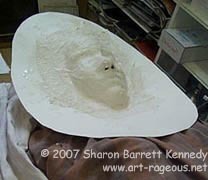 They also completed life-size self-portrait mummy cases (newspaper-stuffed sculptures) which they painted and decorated with Egyptian symbols and hieroglyphics, and "wrapped up" this unit by creating mummy masks using plaster gauze-cast images of their faces and "headdresses." The final assignment was to illustrate an Egyptian myth. 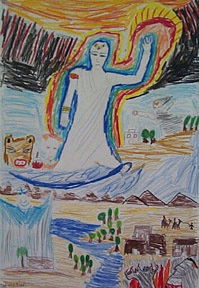 This colored pencil drawing was done by a 6th grader who incorporated all of the gods and goddesses in the story into a wonderfully creative montage! 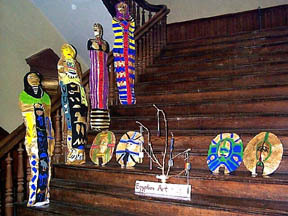 Click on the links above to view the step-by-step lesson plans for these projects. To order some of the books we used as resources, click on the covers!